FRESNO, Calif. (KFSN) -- A Facebook post by the Fresno Police Department isn't giving out the latest crime statistics or "most wanted" persons information. Instead it tells the story of several of their officers coming together to help a homeless man get back to his grandson in Sacramento. This all happened Tuesday when 65-year-old Robert Snyder came to the Southwest Police Substation to simply ask for "help." Snyder is homeless and had been living on the streets of downtown Fresno for several days. He lives in Sacramento and is homeless there as well, but told the Police he came to Fresno this past Saturday with two other people looking for work. Snyder was promised work to make money, but when he came to Fresno he realized they only wanted him to help cash a fraudulent check. He refused and the two men left him stranded. For four days, Snyder had been sleeping in and walking the streets of downtown Fresno. 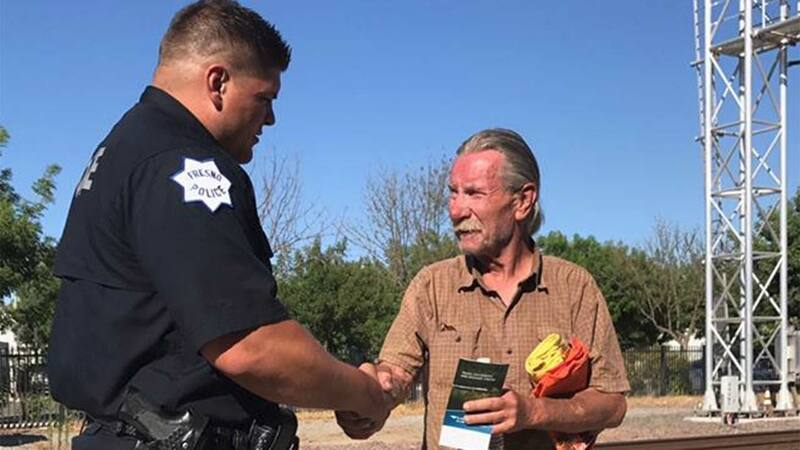 He stated that he has been panhandling daily to make enough money to go back to Sacramento and reunite with his grandson who is also homeless. Police said that Snyder was found to have no local criminal history and was just asking for help to get back to Sacramento. So Southwest Fresno officers pooled their money together and bought him a train ticket to Sacramento on the afternoon Amtrak. Snyder was very grateful for the kindness and stated it was his first train ride ever in his life. DPU Officer Hull provided Snyder a ride to the station and purchased the ticket.